It was early Friday morning when I saw my son. That was the first glimpse I had of him since they took him away. His bruised and bleeding skin sent a sword of pain deep into my heart and tears down my cheeks. Then Pilate, from his chair of judgement, asked the crowd why they wanted my son executed. All around me they shouted, "Crucify him!" I wanted to plead with them to stop, but I knew this had to be. So I stood by and cried silently. Lord Jesus, it is hard for me to imagine the anguish your mother felt at your condemnation. But what about today, when I hold a grudge.....? "Crucify him!" Doesn't this bring tears of anguish to both you and your mother? Regaining a little strength, I walked with the crowds to the entrance of the square. A door flew open and my son stumbled out, the guards laughing behind him. Two men dragged over a heavy wooden cross and dropped it on his shoulders. Then they shoved him down the road. My pain for him was unbearable. I wanted to take the cross from him and carry it myself. But I knew this had to be, so I walked on silently. Lord, Jesus I beg you to forgive me for the many times I have added more weight to your cross by closing my eyes to the pain and loneliness of my neighbor. Forgive me for gossiping about others and for always trying to find excuses to avoid certain people who wish to talk with me. Help me to be like Mary, always seeking to lighten the crosses of others. I followed close behind my son as he stumbled toward Calvary. Nothing had ever hurt me more than to see him in such pain. I saw the cross digging into his shoulders. My heart dropped when I saw him fall face to the ground, the heavy cross landing squarely on his back. For a moment I thought my beloved son was dead. Now, my whole body began to tremble. Then the guards kicked him. He rose slowly and began to walk again, yet they whipped him. I wanted to protect him with my own body. But, I knew this had to be , so I walked on and wept silently. Lord, how often have I seen you fall, and, unlike Mary, have left you there without concern? How often have I seen people make mistakes and laughed at them? How often do I find myself getting angry when someone does things differently than I? Mary offered you her support through your entire passion. Help me to do the same for you by the support I give to others. I had managed to break through the crowd and was walking side by side with my son. I called to him through the shouting voices. .......He stopped . Our eyes met, mine full of tears of anguish, his full of pain and confusion. I felt helpless , ........then his eyes said to me, "Courage! There is a purpose for this." As he stumbled on, I knew he was right. So I followed and prayed silently. Lord Jesus, forgive me the many times our eyes met and I turned mine away. Forgive me the times things did not go my way and I let everyone know about it. Forgive me the times I brooded over little inconveniences or became discouraged and did not heed your call to courage! Yes, Lord, our eyes have met many times, but fruitlessly. I could now see almost complete helplessness on the face of my son as he tried to carry his heavy load. Each step looded as if it would be his last. I felt his every pain in my heart and I wanted the whole thing to end. Then I noticed some commotion near Jesus. The guards had pulled a protesting man from the crowd. They forced him to pick up the back of the cross to help lighten my son's load. He asked the guards why this had to be. I knew, and so followed silently. Lord Jesus, I have many times refused to help you. I have been a selfish person who has often questioned your word. Don't let me remain like Simon, but help me to be like your mother, Mary, who always silently followed and obeyed. As I continued close by Jesus, a woman pushed past the guards, took off her veil and began to wipe my son's sweating, bloody face. The guards immediately pulled her back. Her face seemed to say, "Why are you doing this to him?" I knew, so I walked on in faith, silently. Lord, this woman gave you the best she could. On the other hand, I have wanted to take more than I give. So many opportunities arise everyday for me to give to you by giving to others but I pass them by. My savior, never let me ask why again, but help me to give all I have to you. Again my son fell, and again my grief was overwhelming at the thought that he might die. I started to move toward him, but the soldiers prevented me. He rose and stumbled ahead slowly. Seeing my son fall, get up again, and continue on, was bitter anguish to me. But, since I knew this had to be, I walked on silently. Lord, of all people Mary was your most faithful follower, never stopping in spite of all the pain she felt for you. I have many times turned away from you by my sins and have caused others to turn away from you. I beg you to have mercy on me. I was walking a few steps behind Jesus when I saw him stop. Some women were there crying for him and pitying him. He told them not to shed tears for him. They had the opportunity to accept him as the messiah; like many others, they rejected him instead. He told them to shed tears for themselves, tears that would bring their conversion. They did not see the connection between that and his walk to death. I did, and as he walked on, I followed silently. My savior, many times have I acted like these women, always seeing the faults of others and pitying them. Yet, very rarely have I seen my own sinfulness and asked your pardon. Lord, you have taught me through these women. Forgive me, Lord, for my blindness. This fall of Jesus was agony to me. Not only had he fallen on the rocky groung again, but now he was almost at the top of the hill of crucifixion. The soldiers screamed at him and abused him, almost dragging him the last few steps. My heart pounded as I imagined what they would do to him next. But, I knew this had to be, so I climbed the hill silently behind him. My loving Jesus, I know that many times I have offered my hand to help people but when it became inconvenient or painful to me I left them, making excuses for myself. Help me, Lord, to be like your mother, Mary, and never take my supporting hand away from those who need it. With my son finally relieved of the weight of the cross, I thought he would have a chance to rest. But the gaurds immediately started to rip his clothes off his blood-clotted skin. The sight of my son in such pain was unbearable. Yet, since I knew this had to be, I stood by and cried silently. Lord, in my own way I too have stripped you. I have taken away the good name of another by foolish talk, and have stripped people of human dignity by my prejudice. Jesus, there are so many ways I have offended you through the hurt I have caused others. Help me to see you in all people. 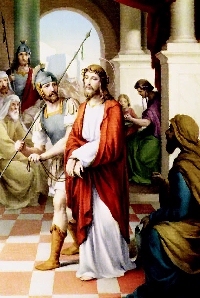 As they threw Jesus on the cross, he willingly allowed himself to be nailed. As they punctured his hands and his feet I felt the pain in my heart. Then they lifted up the cross. There he was my son, whom I love so much, being scorned as he struggled for the last few moments of earthly life. But I knew this had to be, so I stood by and prayed silently. Lord, what pain you endured for me. And what pain your mother went through, seeing her only son die for love of me! Yet, both you and she are ready to forgive me as soon as I repent of my sin. Help me, Lord, to turn away from my sinfulness. What greater pain is there for a mother than to see her son die right before her eyes! I , who had brought this savior into the world and watched him grow, stood helplessly beneath his cross as he lowered his head and died. His earthly anguish was finished, but mine was greater than ever. Yet, this had to be and I had to accept it, so I stood by and I mourned silently. My Jesus, have mercy on me for what my sins have done to you and to others. I thank you for your great act of love. You have said that true love is laying down your life for your friends. Let me always be your friend. Teach me to live my life for others, and not fail you again. The crowd had gone; the noise had stopped. I stood quietly with one of Jesus' friends and looked up at the dead body of our savior, my son. Then two men took the body from the cross and placed it in my arms. A deep sorrow engulfed my being. Yet, I also felt deep joy. Life had ended cruelly for my son, but it had also brought life to all of us. I knew this had to be, and I prayed silently. Lord, your passion has ended. Yet, it still goes on whenever I choose sin over you. I have done my part in your crucifixion and now, my savior, I beg your forgiveness with all my heart. Help me to live a life worthy of you and your mother. We brought Jesus body to a tomb and I arranged it there myself, silently weeping, silently rejoicing. I took one more look at my loving son, and then walked out. They closed the tomb and before I left, I thought, I knew this had to be.......it had to be for you! I would wait in faith silently. Yes, my Lord, this had to be because you love me, and for no other reason. All you ask is that I live a good life. You never said such a life would be easy. I am willing to leave sin behind and live for you alone, in my brothers and sisters. I could only be most grateful for the sacrifices of my son for us. Yet, what emptiness I felt trying to live without him whom I loved so! But, only two days later that emptiness was filled beyond belief, he had RISEN! Our savior had opened the doors to a new life. That is the way it had to be, because his undying love for you would not stop at anything less. I could rejoice forever, but not in silence. My savior, thank you! Thank you for such endless love that helps me to rise out of my own sinfulness. I will try again to live a better life. Help me to always remember that love. Mary, mother of our risen savior, teach me to be like you, and in my love for others, love him in return.